The Forty-Eighth Session of the Scientific and Technical Subcommittee of the Committee on the Peaceful Uses of Outer Space (UN-COPUOS)was held at the United Nations Office in Vienna, Austria. At this session, the second United Nations Platform for Space-based Information for Disaster Management and Emergency Response (UN-SPIDER) Regional Support Offices (RSO) Meeting was also organized. ADRC took part in this event. At the technical subcommittee of COPUOS, the activities of ADRC as focal point for Sentinel Asia's emergency observations in the event of disasters was introduced its accomplishments. 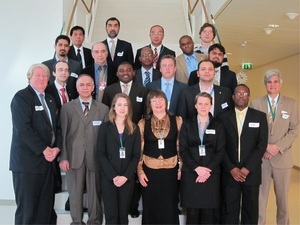 At the UN-SPIDER RSO Meeting, ADRC presented its activities and accomplishments as RSO as well as its future plans. The RSO meeting provided an opportunity to exchange opinions, and explore measures of enhancing future activities of UN-SPIDER RSO.